Those with small children know that feeling of dread associated with a weather forecast of multiple days of rain. Don’t despair, we have the antidote for “Muuum, I’m bored”. When I was a kid, my parents had a box of wet weather toys that were only pulled out when the rain was bucketing down. I’ve tried to implement a similar idea with my kids, but I have a feeling that something with endless imaginative play opportunities, like this cool play caravan from the Land of Nod, would fulfil the boredom-busting brief perfectly. 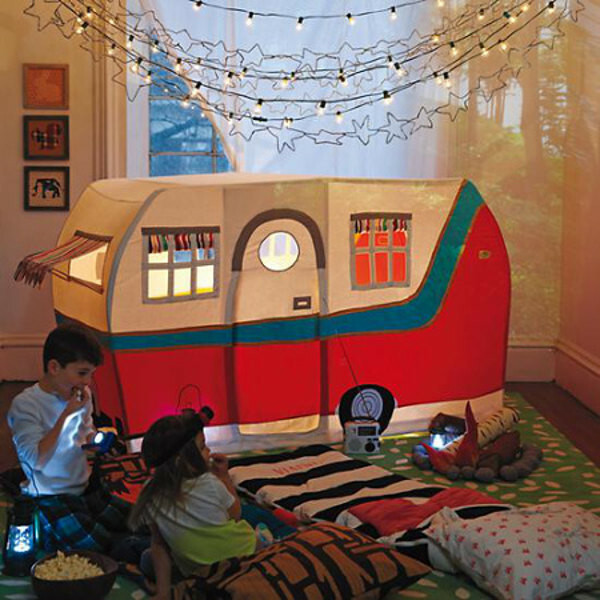 The Jetaire Camper Play Tent takes your standard indoor play tent and turns it up to eleven. 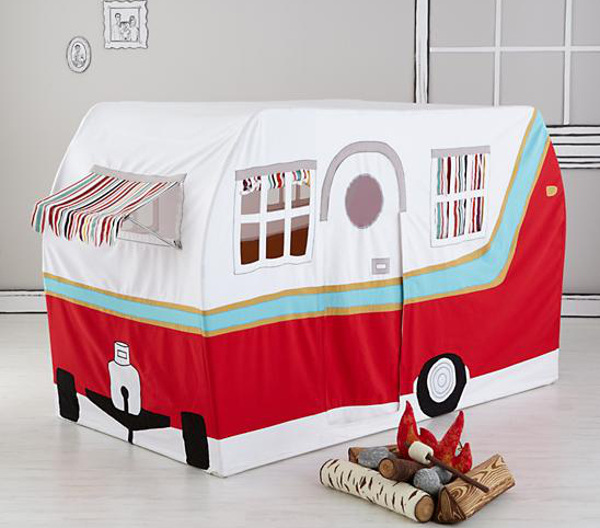 It’s filled with great little details and finishing touches, such as the embroidered wheels and licence plate, roll up curtains and an adorable scalloped edged awning. It’s hand stitched from one hundred percent cotton canvas shell, and propped up with sturdy metal poles. At 116cm tall, 200cm long and 97cm wide, the Jetaire Camper is large enough for multiple children and even an adult to play inside. It can even be used for indoor campouts with friends. The Land of Nod also sell the awesome S’more the Merrier Campfire set to complete the indoor camping experience. Both the Jetaire Camper Play Tent and the S’more the Merrier Campfire are exclusively available from the Land of Nod, which ships internationally. The camper tent is US$249 and the campfire is US$69.